Don’t apologize for stopping conversations, meals or entire relationships in order to consult it – mid-sentence, mid-thought, mid-kiss. 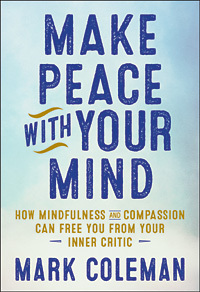 Make Peace with Your Mind is set up to encourage practice. Don’t be daunted by the thirty-one chapters. I timed them and each took about 15-20 mins to read. But I was impatient to get to the practice section so take at least 30 mins to savour the words. Then spend a goodly time with the practices. Some are written reflections, some require wandering out into your world. Either way, these are crucial. As I often say in the mindfulness groups I run: Practice is who you become. It may as well be someone you want to be. Reading Coleman’s perceptive insights into the inner critic – who it really is, how it came to be, how it is embedded in our mind and body – is like turning towards an aspect of ourselves with which we are deeply intimate yet see through blurred eyes. He begins with a big sky view inviting us to see the breadth and depth of this inner process in a way that is, at the same time, immense and safe. After sketching out “The Big Picture” (the first section), he dives into the intricate nature of the inner critic: Self-judgment and How to Work with the Critic. Then ironically, it gets tough: Love and Compassion for ourselves. How can we learn to love ourselves after years and years of being gaslit into no longer trusting our experience of who we truly are. But it’s only when we can connect with ourselves without the filters of fear and anxiety that we can also reach out to others and offer them the same safety through love. Coleman walks us through these stages of understanding and steps to freedom with kind attention and a gentle nudge. Who’s afraid of the inner critic? One of the first practices in this book invites us to take a few moments observing people (while sitting in a public place) and noticing all their faults. Then we are asked to notice what we feel internally. Then we observe people and look for their goodness and again, notice what we feel. It doesn’t take a stretch to see that the former leaves us feeling rather negative and the latter feeling good. Coleman points out that this latter feeling is really where he – and any of us – would prefer to be. Subtly, he also frames it as a choice we have – and, I would add one we made routinely without awareness. Becoming aware of our inner voice that is harsh and critical can be a challenging and somewhat scary journey. After all, that process of singling out missteps, mistakes and misdemeanors is one way we believe we stay honest and can be motivated to try, try harder, try hardest of everyone. It’s an age-old training, likely hard-wired as a survival strategy, keeping us in social herds and adhering to their rules. Of course, over time, these self-judgments can become derogatory commentaries that run like a 24-hour transmission from some personal hell radio. But it’s all we know. Coleman populates his book with examples offered by people he’s trained or treated. My favourite is the image offered by someone who spoke of having an entire boardroom in her head. Being intensely averse to sitting on boards, I can see that my own boardroom is crowded with nay-sayers, scowlers, nit-pickers and ghostly figures of failures past. After reading this section, I decided to dissolve this board of mis-directors and turn the room into a meditation space! (T)he fact that something is true does not justify the critic’s using it as ammunition to undermine our self-worth. Mark Coleman is a mindfulness and meditation teacher in the Insight tradition. 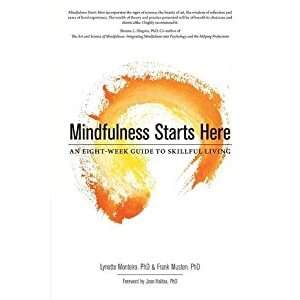 He teaches at Spirit Rock in California and, with Martin Aylward, offers a year-long program that trains mindfulness teachers. He is an executive coach and a master teacher for the Search Inside Yourself Leadership Institute developed by Google. His previous book, Awake in the Wild: Mindfulness in nature as a path of self-discovery, brings the practice of mindfulness into nature.